When you think about endangered animals, usually elephants, tigers, or rhinos come to mind. We were going to include pandas, but they're no longer considered endangered. Rare conservation win - check! There aren't any wild rhinos wandering around Rock Creek Park and the elephants around here chill in Woodley Park, but our region is home to dozens of rare or threatened critters. All of whom depend on the Potomac River and its surrounding lands for survival. As the health of the Potomac has improved, a number of species have rebounded. But there are still many critters in our region struggling as a result of habitat loss and pollution. It's one of the reasons our team here at Potomac Conservancy is passionate about cleaning our local streams and rivers. Our conservation initiatives protect water quality for the health of our community and for the safety of local wildlife. Potomac Conservancy works with small family farms throughout the region to permanently protect riverside forests, preserving habitat for some of our region's most vulnerable critters. We also mobilize local volunteers who remove thousands of pounds of trash from local shorelines, restoring critical habitat and removing plastics that are harmful to animals. Check out 7 threatened or endangered* animals that we're helping to protect - and take action to make a difference! The smallest member of the weasel family may look cute and cuddly, but the least weasel is actually a predator that often hunts animals much larger than itself, like rabbits. Least weasels were once commonly found throughout Maryland and Virginia, but their populations have shrunk over time, and they are now rarely seen by humans. While pop culture has caused many people to associate bats with vampires and sucking blood, the only thing that this bat will harm is pesky insects. The Indiana Bat has been ranked as globally endangered since 1967 and has suffered from rapidly declining populations due to a disease known as White-nose syndrome. This uniquely colorful water snake is often known as an “eel moccasin” due to its appetite for eels, its main food source. Unlike many other water snakes, the rainbow snake is rarely seen out of the water. Occasionally, on a rainy summer night, you may catch a glimpse of one as it makes its way across a road from one body of water to the next. 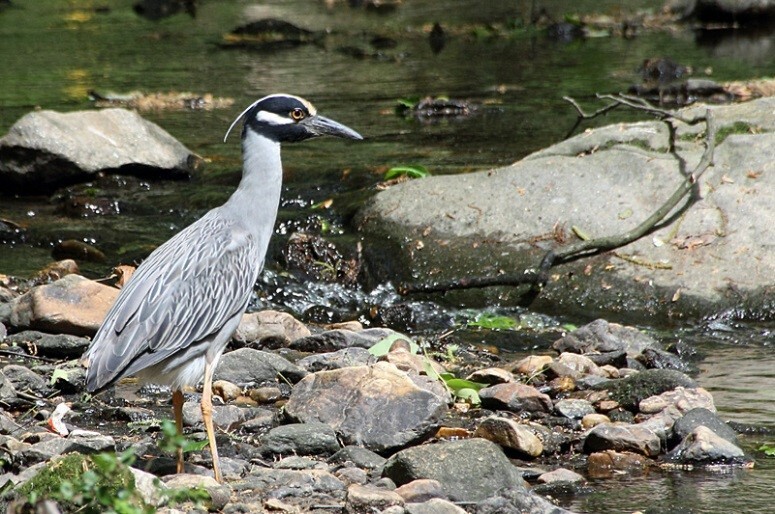 Many people are familiar with the larger great blue herons of the Chesapeake Bay, but have you seen the yellow-crowned night-heron wading through any of your local streams and ponds? While this particular heron can be found in a large geographic range throughout the Eastern United States and the Caribbean Islands, populations have been threatened by the loss of wetlands in the Potomac region as a result of rapid development. Did you know that the second largest rodent in North America is a great swimmer and loves to climb trees? Porcupines are often feared for their quills, but they rarely attack, opting to flee predators instead. Luckily, the surface of their quills are treated with an antibiotic, so there’s no need to worry about an infection if they happen to prick you. The decline in population throughout the Potomac region is mainly attributed to the loss of their favorite snack tree, the Eastern Hemlock. These trees are being destroyed by Woolly Adelgids, and with them, our local porcupines are disappearing. The name “black bear” is actually a misnomer; American black bears can range in color from honey, to red, brown, or black. Hikers may worry about spotting Black Bears while they’re out enjoying the beautiful trails around our region, but they tend to steer clear of humans whenever possible and rarely attack if you do cross paths. Wood turtles are native to areas north and west of Washington, DC, in the Potomac headwaters of Virginia and West Virginia. Their main threat is habitat destruction. In many areas, the vernal pools, clear streams, and streamside forests that wood turtles rely on are being paved over or degraded by development and deforestation. 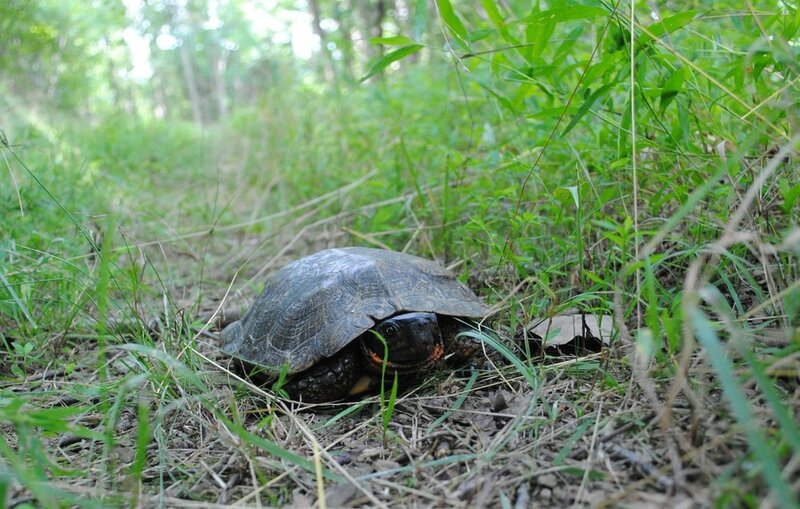 Potomac Conservancy’s Land Protection program holds conservation easements on a number of properties with wood turtle habitat. *Some of the animals on this list are classified as “least concern” on the IUCN’s global Red List of Threatened Species, but are threatened locally. You can find a full list of local animals ranked as threatened or endangered here.